Our Montessori work time is a busy time at BMM. All of our classes have this time for their friends to explore their classrooms and the works on the shelves. 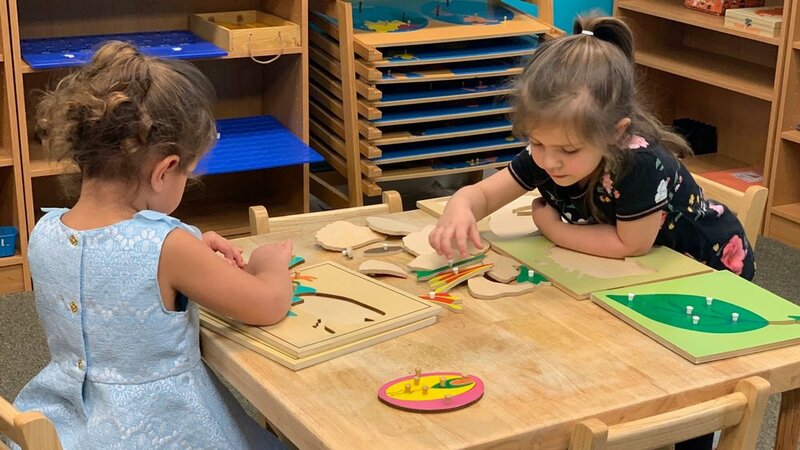 The uninterrupted work time is designed for them to be able to learn independently and grasp concepts and ideas on their own. Our teachers are always there as guides (to give lessons or redirect) but are otherwise out of the way so their friends can exercise their independence. Each classroom is designed and prepared to be an environment open for the kids to explore. There isn’t much that they can’t touch and inquire into. They have options of choosing a work and sitting at a table or using a rug on the floor for their workspace. Our teachers at BMM are great at having a variety of works to do and each child is busy with something of their choosing. The uninterrupted work time allows for children to increase their independence and strengthen their abilities to focus. We have a few categories or sections of works in each classroom: language, math, cultural studies, practical life, and sensorial. We also have an art section for friends to have a place to use their creativity. Each of these categories are designed to assist the child in learning about specific topics at an age appropriate progression. It is always so fun to see the friends choosing things they are interested in and watching them learn as they figure their work out. Here at BMM, we love our work time! We switch out themed works each month with correlating holidays that are coming up. All of our friends are always excited to see new works on the shelves as we cycle through them throughout the year. We encourage parents to ask their children what they did at school each day, and which works they did during work time! We're happy to take you on a tour of our award winning Montessori. Just give us a call or send us an email to schedule a walking tour with one of our directors.